NEW DELHI, India (CNN) -- At least 87 people have been killed in a powerful cyclone that slammed Bangladesh and neighboring India, officials said Tuesday. Some 59 deaths occurred in Bangladesh when Cyclone Aila struck Monday, said Sultanul Islam Chowdhury, a deputy secretary with the country's ministry of food and disaster management. More than 2.4 million people have been affected and at least 34,000 homes destroyed, he said. The storm left 803 people injured, he added. 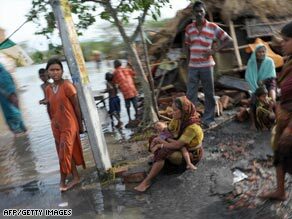 In eastern India, officials put the death toll from Aila at 28. It caused an estimated $8 million damage in one district alone, said Debabrata Pal, West Bengal state's disaster management joint-secretary. Aila packed winds up to 50 miles per hour (80 kilometers) when it struck West Bengal. The storm had weakened over the sub-Himalayan region of the state by Tuesday, India's main weather office said in a bulletin. It predicted heavy rains in northeastern parts of the country during the next 24 hours.